I drove past four upright European hornbeams (Carpinus betulus ‘Fastigiata’) today that were riddled with Japanese beetle (Popillia japonica) damage; or so I thought. Since I was planning to do a BYGL Alert! on the high numbers of beetles that we’re seeing in Ohio this season, I turned around to snap a few shots of the damage as well as the coleopteran culprits. However, during the time it took for me to turn around, park, and walk to the trees with my camera, the coleopteran damage somehow morphed into lepidopteran Common Bagworm (Thyridopteryx ephemeraeformis) damage. It was the most complete of any complete metamorphosis that I’ve ever seen! 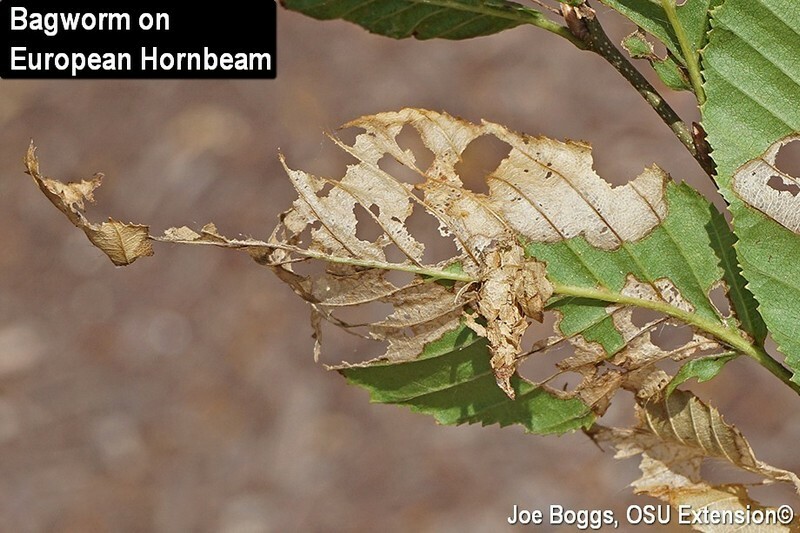 The worse part about this beetle-brained story is that Jim Chatfield showed some wonderful examples of bagworms on an American elm today during our BYGL Zoom Inservice. We oohed and aahed at how much certain phases of the damage mimicked Japanese beetle damage. Yet, only a few hours later, I was bagged by a drive-by diagnosis. The take-home message is that bagworm populations are very high this season; at least in southwest Ohio. These caterpillars wrapped in silk bags camouflaged with host plant debris are difficult to spot particularly in the early and middle-instar stages. Bagworms can feed on over 130 species of plants including many deciduous trees. Always take a second look at browned, see-through leaves even if beetles are buzzing … in your head. Bagworms are sneaky feeders; their damage may be blamed on other pests.